I recently moved into a much larger rental and have so much more space to quilt. I have an entire loft space in which I can make a mess and never have to clean up when people are coming over. Now, I can just close the door. 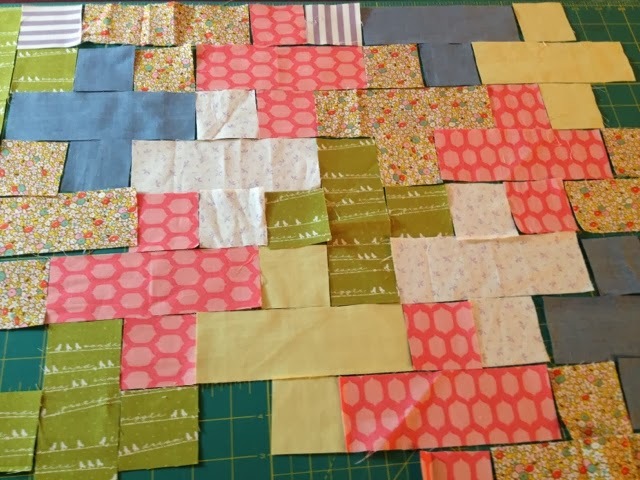 I have been putting off making this quilt due to lack of space. My dear friend is having her first child. She originally said she was going to have a gender neutral baby room. After preliminary photos were sent to me, I realized her idea of gender neutral was different than mine. I am thinking primary colors, or yellows and teal or grey and orange. She went for a country chic look. I love it. 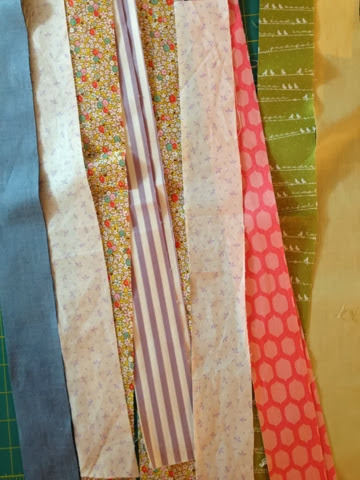 I was able to use some of my favorite fabrics I have been hoarding for years. The white with tiny purple flowers is from the first set of fabrics I ever purchased at the ripe age of 13. The solid yellow is from vintage sheets I got from my grandfathers house when he passed, they are ohh sooo soft. The yellow with tiny flowers is my absolute favorite fabric in my entire collection. I have many items in my life made from this fabric; top, bag, pillow, jewelry roll. I still have 3 or 4 yards left even after making this quilt. I started with strips. The chambray is timeless, a true favorite of mine. I love denim or denim looking items. Gotta **~ LoVe~** the stories that fabrics hold. Then I struggled with my initial design intentions. I wanted to do the plus pattern, unfortunately I cut all my green strips the wrong direction. So, when I laid it out, the direction of the birds on the lines drove me crazy and the pink popped too much. I realized it wouldn't easily be pieced together, even if I changed the direction of the plus. I left my quilt laying out for a few days while I pondered over its fate. I totally scrapped the whole idea and when for something else. I HAVE to get it finished this weekend, the baby is due in a week so...hopefully I'll have a pic for you soon. Instead of a finished shot of the quilt, I leave you with a beautiful image of Crater Lake, OR and Wizard Island in the middle, from last weekend. Vacations get in the way of my quilting often, maybe if I didn't live in such a beautiful state. Nawwhh. 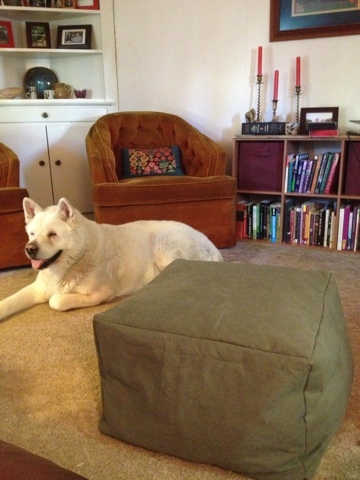 I have finished my foot stool pouf. It took very little time. After much deliberation I settled on making it 20x20x13, I didn't have quite enough fabric to make it 20x20x20 .I love it . I still think it could use a bit of foam so that it could serve as a stool, not just a foot rest. I really made it to got with these awesome chairs, I got for a steal over a year ago. I think the dog likes it too. She is still too big to even think about curling up on this one. 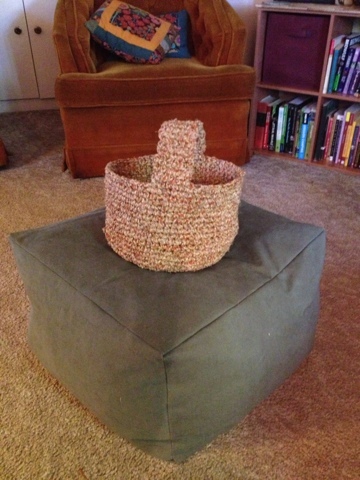 I also completed this crochet basket that I remade about 6 times in order to get the dimensions I was looking for. I love how this came out with the handle and all. Not quite sure where it will go, but I do think it is a nice size.